I have been testing the Men’s Society ‘Beard Washing Kit’ over the past few days and it is one of a number of kits contained in a tin for various occasions and tasks. Upon opening the tin you are greeted with a card wrap saying “Hello handsome” and it has been many years since I have had that greeting! Inside the Men’s Society ‘Beard Washing Kit’ there is a 50ml Beard Shampoo,, a 10ml Beard Oil, a small metal comb in the shape of a moustache and a cloth bag containing five compressed hand flannels that emerge from their pill shape once dropped in water. The shampoo produced a nice lather and has a woodsy scent which is rather nice, it cleaned my beard nicely and left it feeling okay. The shampoo however does contain various ingredients that aren’t natural like the shampoo’s that I usually test, but saying that it’s probably on par with many products you use in the shower and has been safety tested etc. The beard oil is made up from Grapeseed oil, Thyme Oil and Vitamin E and has a pleasant citrus scent. The oil left my beard feeling soft and the scent is very fresh and pleasant. I was pleasantly surprised by the oil. This is never be bought by guys who are serious about their beard, now that is not a negative. It’s just that the guys on the ‘Guardians of the Beard‘ Facebook group all have a decent arsenal of beard care products from various brands and when they go away for a weekend or on holiday, they carefully choose what they are going to take. However this is a great gift tin, the tin is sturdy and looks good and the contents are actually okay, I was expecting the products to be poor quality and the oil to be packed out with paraffin oil for cheapness. Men’s Society have provided a nice natural beard oil and a shampoo that is gentle. The comb is a nice addition and is great to sling in your pocket to tidy your tash as and when needed. My grandson loved the flannels and screamed as they emerged from their dehydrated state and they are handy for use on a weekend away. 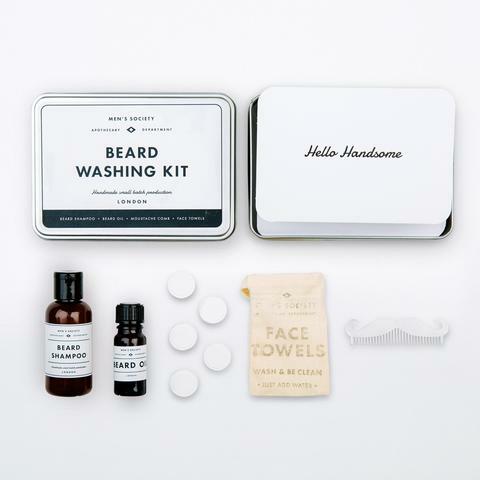 The Men’s Society ‘Beard Washing Kit’ costs £25 from the website and there is a selection of tins to choose from, so if you are looking for a gift for a man, give them a look. I know that my wife has bookmarked men’s Society for gifts for men in the family. They also sell a wide range of gifts for many uses and occasions. I am also extremely happy to report that Men’s Society supports CALM, which is the Campaign Against Living Miserably. I tested an oil last year from a brand that also supports this charity and the work to help men who suffer from mental health is vital. I am a firm believer in talking about mental health but many men still feel unable to discuss it as they are worried it makes them look weak. Hugo Middleton, the founder of Men’s Society, found an old tobacco tin in the musty service jacket of his late grandfather. Intrigued, the young Hugo prized open the lid. The smell of aged tobacco struck him almost immediately but the contents were not what he expected. Inside were a metal comb, a key and a picture of Hugo’s grandmother. The sentimentality of this beloved item is what inspired Men’s Society’s first products – male gifting kits presented in metal tins much like that of his grandfather. Now at Men’s Society, we pride ourselves on our quality range of gifts and accessories for men – each of which encapsulates the magic of Hugo’s grandfather’s tobacco tin. Each kit we sell is designed to be stored away until needed or to wait in a bag until required. Whenever the tin is removed from a shelf or lifted from a bag, its owner will enjoy the same sensation of reassurance that his needs can be met in time honoured tradition. Our gifts are items of quality, rigidity and tradition so that one day they may inspire inquisitive minds to take hold of the world they inhabit.